How to find the right tactic? Which tactic is the right one? In soccer, there is no easy answer to this question. This article will cover which factors a coach should take into account, in order to find the right tactics. This can be completely different from game to game and therefore it is important that the coach is well prepared. We are working on animations for the different texts, which explain offensive and defensive tactics. We will inform you of the release dates for these via our newsletter, Facebook and Twitter. Team Tactics are made up of actions by players that are coordinated with one another. This applies to a team’s offensive and defensive moves in equal measure. To give a basic example, saying “everyone into offence” or “everyone, switch to defense” would already be a team tactic. These tactics can be improved and made more precise with specific training. A team’s tactic is defined by planned action, as opposed to chaotic play. B. Which team tactic is best? Soccer is so complex that there is no such thing as the “right tactic”. Game tactics are often compared to chess games and this comparison is fairly accurate. The coach has the responsibility of finding the right tactic, and this is dependent on many different factors. Many games are lost due to an incorrect tactical concept. Unfortunately, this is only noticed when the game is over. Sometimes it is never noticed. It doesn’t happen often that a coach takes responsibility for a defeat. C. Before the game – How do I find the best tactic? 1. What is my team capable of? What are my team’s strengths and weaknesses and what can I expect with regard to tactics? Which players do I have at my disposal? 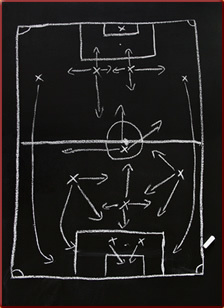 The tactical plan should cover up weaknesses and expose a team’s strengths. 2. What is our opponent capable of? The referee can play an important role when it comes to finding the right tactics. What is the situation with off-side decisions? Is the referee lenient? D. The game is on – correcting game tactics? During a game, the tactical set-up should be working. Everything was perfectly clear before the game, but now it’s all different: an important player has been removed from the game, the opposing team doesn’t have the expected line-up, the referee misses every off-side, it’s raining, or your team is losing two to nil. These things should have been dealt with much earlier. There is nothing worse than stubbornly sticking to a tactic. As coach, you should be as flexible as possible and react in good time. At the same time, you need to be able to gauge what you can demand of your team. One more thing before I forget: the opponent is sometimes just too strong; no tactic will help you in such situations.